I went digging in my makeup pit... er, collection, and found this eyeliner that I've had for a while, but never tried. 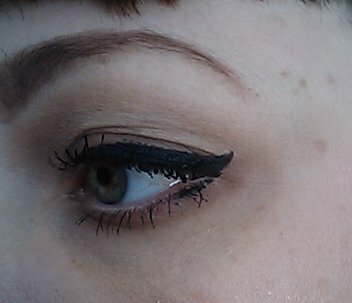 Liquid eyeliner has always been a "miss" for me, because it seemed like no matter how hard I tried, that stupid little brush would go everywhere except for where I wanted it. I bought this one when I was trying to find an eyeliner that wouldn't smudge, and discovered Sormeh (here and here) before I got around to trying this one. I say, B-S on the "soft, felt-tip brush" bit. It looks like a tiny marker tip, and is very firm to the touch. All I can say is, thank goodness for that. I can actually apply this stuff exactly where I want it, and I don't have to worry about applying uneven pressure. 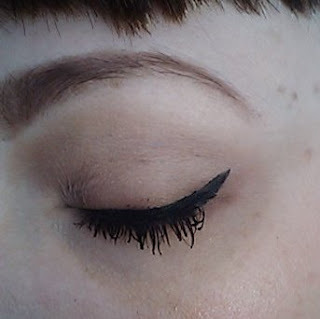 If you have never tried liquid eyeliner, let me explain why that matters; if you have a soft brush, and apply uneven pressure, your line width with change because you'll flatten out your brush. It is this simple principle that always left me with wonky looking liquid eyeliner... until now!!! Check it out! That was my first try, ya'll! Here are some more pics, so you can see how thick the line really is (the mascara application give the illusion that the line is very thin). Now, about it being waterproof. Water alone will not remove this. At all. Facial cleanser barely puts a tiny dent in it. My almond oil is the only thing that will remove it. It takes several swipes, and patience, to remove it. Don't loose patience and start scrubbing at it, because you will end up with raw skin from scrubbing so hard. Just give the oil a chance to loosen it up, and keep gently wiping at it. If you apply it to bare skin (meaning, no eyeshadow on the lid first), you are going to have an extra-hard time getting it off. If you apply it over eyeshadow, that difficulty level decreases... slightly. I highly recommend applying it over your eyeshadow, because even that slight decrease in removal difficulty is worth it. If you don't wear shadow, then swipe a layer of face powder on your lid first. 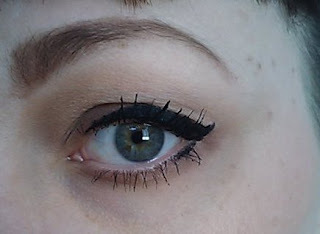 I have been wearing this liner all week, and every night is has looked as freshly applied as it did in the morning. It didn't chip or flake or fade. It also doesn't feel "tight" on the lid, like it is grabbing onto your skin. It doesn't feel like I am wearing anything, actually. 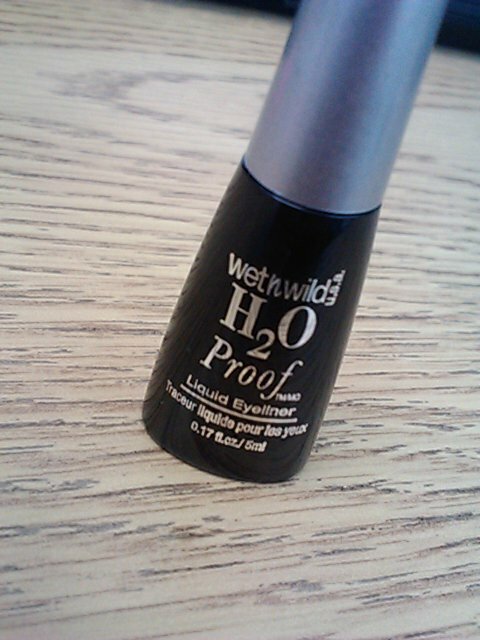 If you are looking for a liquid eyeliner that won't budge, I recommend trying this one.